Hey everyone! So I just got finished packing for our first family road trip tomorrow and decided a new nail color was in order. I previously had on Essie’s Sew Psyched. It’s definitely one of my new favorite colors & I promise to review it soon. Now onto the color I decided to choose for this current manicure. 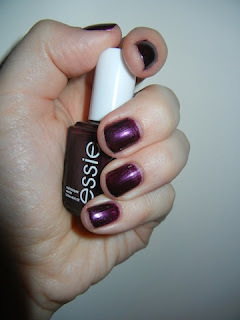 I chose Essie’s Damsel In A Dress. It’s a really gorgeous deep reddish purple color. Perfect for Fall! It was SO difficult to capture the true color with my camera…But I did the best I could! 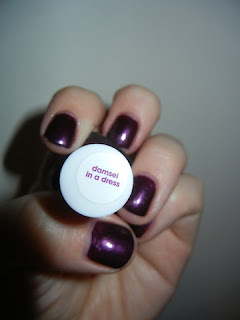 This is two coats of Damsel In A Dress & I also used Essie’s Top Coat Good To Go. And I am apologizing in advance for the HORRIBLE job I did painting my nails tonight. I was in a rush and had so many other things to do. I saw that yesterday and I wanted it so bad! I haven to try and be good now though. I’ve bought way too much nail polish and makeup..
It’s one of my favorites! I definitely recommend it! It’s such a go to fall color. I love this color, do you sense I’ll be borrowing it? Yesssss!